The Silk Road or Silk Route was an ancient network of trade routes that were central to cultural interaction through regions of the Asian continent connecting the West and East from China to the Mediterranean Sea. The Silk Road derives its name from the lucrative trade in Chinese silk carried out along its length, beginning during the Han dynasty (207 BCE – 220 CE). The Central Asian sections of the trade routes were expanded around 114 BCE by the Han dynasty, largely through the missions and explorations of the Chinese imperial envoy, Zhang Qian. The Chinese took great interest in the safety of their trade products and extended the Great Wall of China to ensure the protection of the trade route. A cross-border region, in which eTechnologies (Information and Communications Technologies – ICT) are extensively used, is considered as an eRegion. The borderless nature of eTechnologies allows and calls for new approaches to efficient and effective cross-border eCollaboration between the organizations within a specific macro region and between regions themselves. The interoperability of eRegions is a common challenge for all regions and is in the focus of the eRegions Think Tank . The Think Tank Network for research and views exchange of national and local government, business, ICT providers, diplomats and the academia is an important mechanism for innovative accelerated development of the 16+1 Initiative. There are several goals on its agenda. Overall, its most important task is to investigate why and how diverse organizations in the cooperation of sixteen Central and Eastern European Countries (CEEC) with China could be involved, as well as how they could strengthen and further develop their relations, create synergy opportunities and identify challenges and opportunities ahead. In the period 2001 – 2010 numerous events focusing at eRegion research and development issues and opportunities have been organized in Slovenia. Several have been investigating revitalization of the historic trading Silk and Amber Roads in the environment of Internet and logistics eTechnologies. For the first time, a panel New Silk Road was on a program of the Bled eConference in June 2002. It was followed by the Slovenia – Hong Kong eCommerce Study tour to China. The study group members were: Dr. Doug Vogel and Dr. Roger Harris of the City University of Hong Kong, and Mr Stanislav Plavec, Chairman of the Board, eCenter, and Dr. Jože Gričar, University of Maribor. A component of the study tour was the Urumqi Meeting of the Xinjiang Silk Road Project (currently the city population is three million). 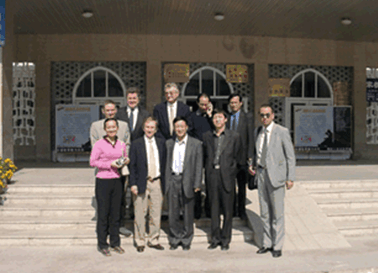 The meeting was organized by the Information Science & Engineering College, Xinjiang University and the Urumqi Business Community, Xinjiang Uygur Autonomous Region, Western China, on September 30, 2002. In the meeting, interest has been explained in goods shipments from Western China to Europe overland. The goods are shipped 4.000 kilometers East to the Port of Shanghai first, and than by a ship via Sues to Europe. Shipping the same distance overland towards the West, the goods would almost arrive to Eastern Europe. On October 8, the Slovenia delegation was meeting with Director General of the Department of eCommerce Administration, Ministry of Foreign Trade and Economic Cooperation, nowadays, the China International Electronic Commerce Center, Ministry of Commerce, Beijing. 2003 The New eSilk Road in Perspective. Panel. 2004 Supply Chain Security Systems To Protect The Amber And Silk Road. Panel. 2006 eSilk & eAmber Road Regions Meeting: Business and Government Executives & Professors’ Commitment to Making A Difference. 2007 eSilk & eAmber Roads Innovative Regions Think Tank: Business and Government Executives & Professors’ Commitment To Making A Difference. 2008 eSilk & eAmber Roads Innovative Regions Think Tank: Business and Government Executives & Professors’ Commitment To Making A Difference. In June and September of 2010, there were two meetings in the European Parliament: European Initiative Danube Region on the eSilk & eAmber Roads. eRegion is a cross-border region of the neighboring countries in which eTechnologies (Information and Communications Technologies – ICT) are extensively used in business processes. The borderless nature of eTechnologies allows and calls for new approaches to efficient and effective cross-border eCollaboration between the organizations within a specific macro region, and between regions themselves. Of particular interest is the interoperability of the eRegions on the New eAmber and New eSilk Roads (Baltic, Danube, Adriatic-Ionian, Alpine), including the cooperation of sixteen Central and Eastern European Countries (CEEC) with China. The panel will investigate how diverse organizations in the eRegions could be involved, as well as how they could strengthen and further develop their relations, create synergy opportunities and identify challenges ahead. On September 21, 2014 one of the plenary panels of the 4th Danube eRegion Conference – DeRC 2014: Cross-border eSolutions & eServices Prototypes Development had a title Danube eRegion on the Crossroads of the New eSilk & New eAmber Roads. In order to discuss the issues to be addressed by the panels of the DeRC2015 conference, there was a brain-storming session Slovenia’s Involvement in the New eSilk & New eAmber Roads Development in the Ministry of Foreign Affairs, Republic of Slovenia on June 9, 2015. In order to prepare a program of the 6th Danube eRegion Conference – DeRC 2016: Cross-border eSolutions & eServices Prototypes Development in Ljubljana, Slovenia on September 19-20, 2016, cooperation with the eRegions on the New eAmber and New sSilk Roads is desired. For example, the Caucasus eRegion organizing the Tbilisi Silk Road Forum . The undergraduate and graduate students are suggested to engage with their instructors in innovative cross-border eSolutions and eServices prototypes development in cooperation with the organizations – prototype recipients in at least two countries. Students’ prototypes presentation sessions are a component of the conference. The experience of the DeRC2015 preconference meeting Regional SAP University Alliance Meeting with Extended Invitation to the Rectors & Deans in the Danube Region is very encouraging. On October 10, 2015, the eRegions Think Tank has been initiated. On November 9-10, 2015, the Slovenian – Chinese Economic Forum Invest in Maribor has been organized by the Municipality of Maribor – University City. On March 15, 2016 there was the eRegions Think Tank Meeting in the Castle Jable nr. Ljubljana, Slovenia. The meeting was co-organized by The Ministry of Foreign Affairs of the Republic of Slovenia and the Members of the eRegions on the New eAmber and New eSilk Roads Think Tank together with the Centre for European Perspective – CEP. China’s ‘Digital Silk Road’: Pitfalls Among High Hopes. Will information and communication technologies help China realize its Digital Silk Road? Will the new ‘Silk Road’ be a success? World Economic Forum Annual Meeting 2017: System Initiatives Programme. Silk Road route back in business as China train rolls into London. All Aboard China’s ‘New Silk Road’ Express: China’s railway from the Pacific to London. Cross Border Co-Operation through Tourism Promotion & Cultural Exchange: A Case Study along Nepal and China (T.A.R.) OBOR—Prospective. China’s ‘New Silk Road’ brings great promise to eastern Europe. EU-Uzbekistan Relations: Paving the New Silk Road. China’s Vice Premier Promotes Silk Road Economic Belt on 4-Country Tour. Zhang Gaoli sought to drum up interest in the ambitious trade and infrastructure network in the Caucasus. India watches anxiously as Chinese influence grows. By CEPS Team: Prof. Jacques Pelkmans – Overall Study Leader, Dr. Weinian Hu, Federica Mustilli, Mattia Di Salvo, Wti Team, Prof. Joseph Francois – Wti Team Leader, Dr. Eddy Bekkers, Dr. Miriam Manchin, Dr. Patrick Tomberger. Centre for European Policy Studies – CEPS, Brussels April 17, 2016, pp 308. The cultural aspects of the Belt and Road could forever reshape regional politics and security. The Changing State of Knowledge Exchange between Academics and the Business, Public and Third Sectors. UK Academic Interactions with External Organisations 2005 -2015. China’s Silk Road revival steams ahead as cargo train arrives in Iran. Goods travel 6,462 miles in 14 days as part of efforts to resurrect ancient trade route connecting east with Europe. China’s attempts to extend the New Silk Road westward have encountered problems. By Dr. Klaus Schwab, Professor, Founder and Executive Chairman. World Economic Forum, January 14, 2016. The New Silk Road: A Path to Regional Security? Is China’s ‘Belt and Road’ a Strategy? When is a strategy not a strategy? The Economics of the Silk Road Economic Belt. The Suzhou Guidelines for Cooperation between China and Central and Eastern European Countries. Is There a Place for the West Along China’s New Silk Road? Western Europe Is Missing the Boat on China’s Silk Road. The opportunity is there, but will Western Europe seize it? Conference Call: Time to give up on the New Silk Road? Bridging the Sino-U.S. ‘Digital Divide’. Is the Czech Republic China’s New ‘Bridge to Europe’? Hungary: the flagship of China in Europe? Joint Statement of the Heads of Government of the Visegrad Group Countries. Will others join Hungary on China’s New Silk Road? 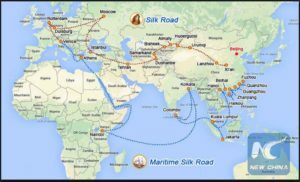 Iron Silk Road: Dream or Reality? How useful is the new Silk Road for freight? Can China’s New Silk Road End Greece’s Economic Tragedy? What are the prospects for the new Chinese-led Silk Road and Asian Infrastructure Investment Bank? Reflections on Maritime Partnership: Building the 21st Century Maritime Silk Road.